Wild Apricot is web-based software that automates and simplifies the management of your membership and your website. For step-by-step instructions on setting up Wild Apricot, see our Quick setup checklist. You can access your Wild Apricot account from anywhere with a browser and an Internet connection. If you have volunteers and board members working from home or from different offices, they can all access the same data at the same time without updating and emailing membership lists back and forth. Through your Wild Apricot website, tour members can access member-only pages, and perform self-service functions such as updating their membership profile, renewing membership, and paying invoices online. You can store information in your database about other kinds of contacts other than members, such as donors or event attendees. Contacts can be added to your database through online forms, manually by administrators, and in bulk by importing. 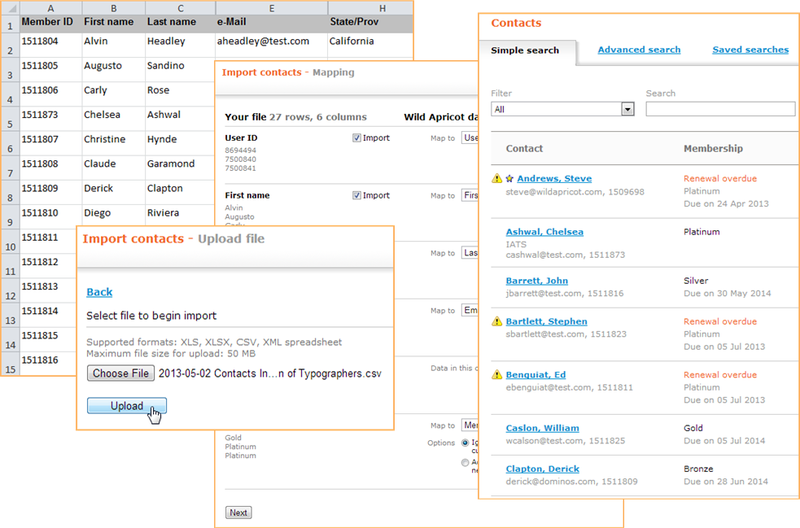 You can customize your contact database – and the forms that appear on your Wild Apricot site – by adding, modifying, reordering, and deleting database fields. To get you started, your Wild Apricot website is already set up with sample contact records and sample pages such as membership application and event registration. You can create new pages and modify existing ones, and customize the look, feel, and functionality of the site. If you already have your website, you can add Wild Apricot forms and functionality to your existing site. Both you and your members log into Wild Apricot from your Wild Apricot site, not www.wildapricot.com. If you do not remember your Wild Apricot website address, check your email inbox for the welcome email that was sent to you when you signed up for the account. You can change your free Wild Apricot name at any time (e.g. to newname.wildapricot.org) or use your own custom domain (such as your-organization.com). You can set up additional administrator accounts for your staff and volunteers, and assign them appropriate administration rights (see Managing site administrators). Public visitors to your site can view the pages you have made visible to everyone, including event registration and membership application forms. Members can view member-only pages and access online self-service functions such as updating their membership profile, checking membership status, renewing membership, and paying invoices online. 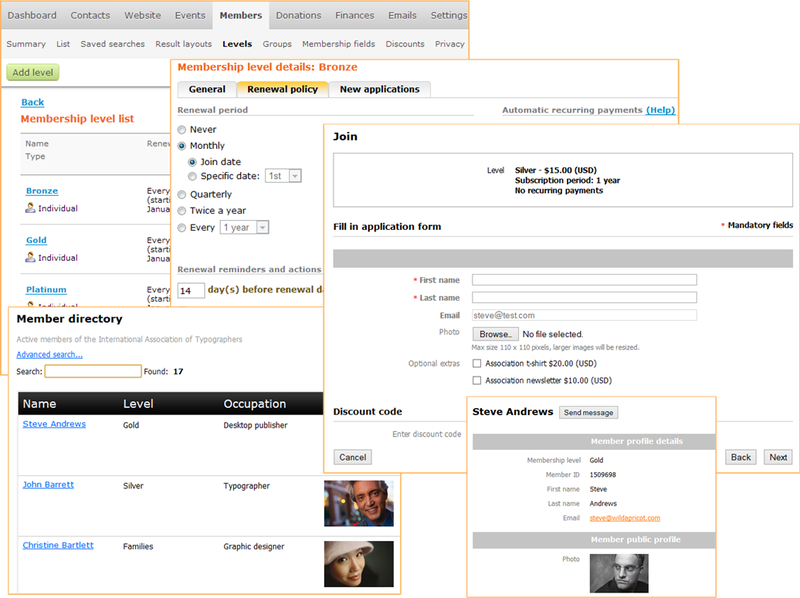 Wild Apricot admin screens are grouped into pull-down menus according to their functional area. You can jump to another admin screen by selecting the appropriate option from the menu. 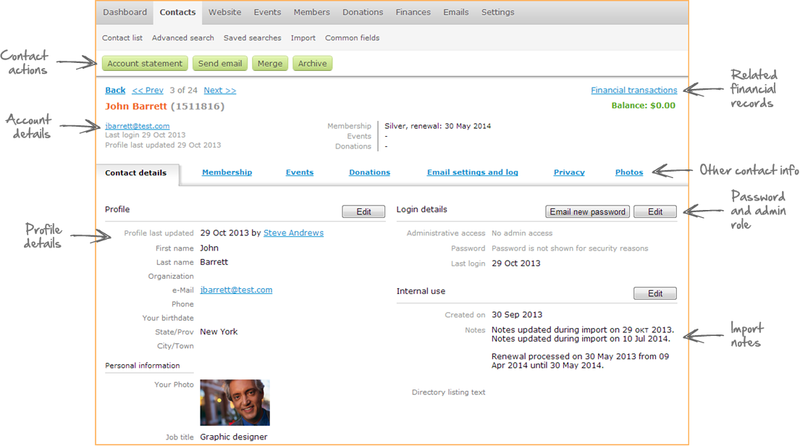 A number of administrative options also appear within the admin logo area in the upper right corner of admin view. You can use these options to switch between admin and public views, print, view help, request support, view account information, and log out. For more information, see Navigating Wild Apricot. Everyone in your Wild Apricot database is a contact . A contact can be a member, an event attendee, a donor, a newsletter subscriber, or any combination of these roles. You can customize your contact database – and the forms that appear on your Wild Apricot site – by adding, modifying, reordering, and deleting database fields. In addition to their contact record, each contact can also have a membership record, and one or more event registration records or donation records. Members are considered contacts but are different from other contacts because they have a membership level assigned to them and have additional information stored in membership fields. From your contact list you can find, search, and filter all of your contacts to update records, send out email blasts, and export your records. You can also save searchesto reuse them in the future. To get started, you can import your existing contacts/members. Contact records are created automatically when people sign up for a membership (see Membership application form), register for an event (see Adding an event calendar to your site), subscribe to a newsletter (see Email subscription form) or make donations (see Donation forms). For each contact, you can view full details and all related activity (e.g., registrations, donations, event attendance, etc.) from their contact record. On your Wild Apricot site, members can access member-only pages and perform various self-service functions, such as renewing their membership, and updating their email preferences and privacy settings. What most distinguishes members from other contacts is that members are assigned to membership levels. You can create multiple membership levels, each with different membership fees, subscription periods, renewals policies, and benefits. You can limit access to events, web pages, and database fields by membership levels. For each membership level, you can set the membership fee and decide on the membership renewal process. You can fully or partially automate the renewal process. If you want to offer group memberships to companies, teams, or families, you can set up a membership bundle level, rather than an individual level. So that visitors to your site can apply for membership in your organization, you need to add a membership application form to your website, if it isn't there already. I'll show you how to embed an application form on another site a little later on. The fields that appear on the membership application form are drawn from your membership fields and common fields. You can create custom membership fields and restrict them to specific membership levels. So that visitors to your site can see a list of your members, search for members, and view member profiles, you can add a member directory to a page on your site. Clicking on a member listing within the directory will display that member's profile (subject to their privacy settings). Each Wild Apricot account provides a website , hosting for the website, and the tools – known collectively as a Content Management System (CMS) – to set up and manage the website. By default, your site is already set up with several useful pages, including a membership application form and an event calendar. You can quickly and easily create new pages and modify the default ones, and customize the look, feel, and functionality of the site using interactive tools provided by Wild Apricot. 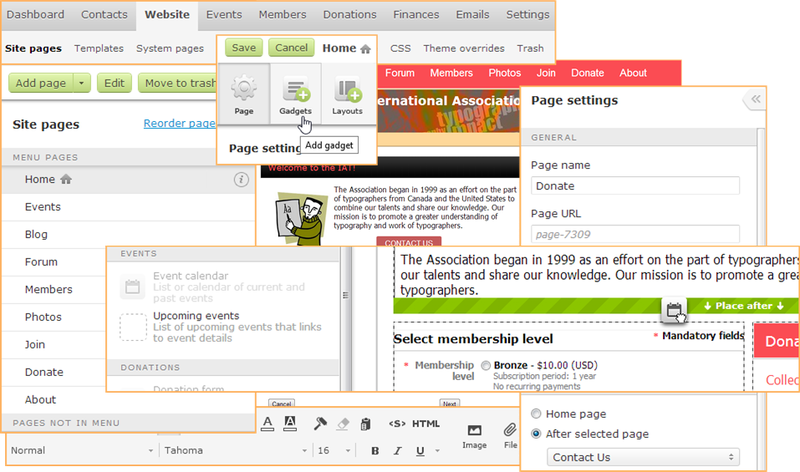 You can add as many site pages as you want, and group site pages under one another to form multi-level menus. 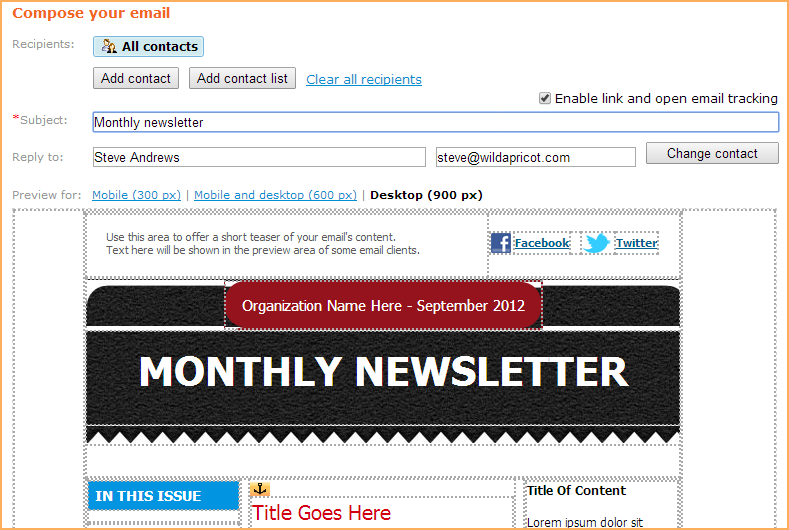 When you add a new page, you can select the page template whose content and layout the new page will inherit. You can set up multiple templates, each with its own layout and shared content. Each page can be based on a different template, and multiple pages can share the same template. For each page, you can control various page settings, including page name, URL, access permissions, and meta-tags. You can also control whether the page appears in your site menu. You can design pages to display dynamic content from your Wild Apricot database, or static content that you add directly using an editor. You can add custom HTML to embed external content or third-party widgets. The overall look of your site depends on which website theme you choose. A default website theme is assigned when you create your Wild Apricot account. You choose a different website theme from a gallery of professionally designed themes, then customize your theme in a variety of ways. 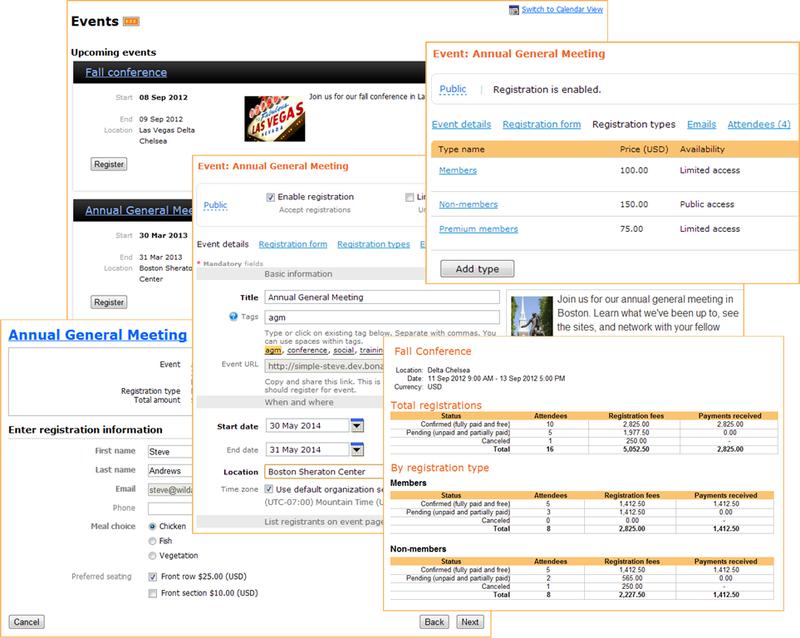 With Wild Apricot's events module , you can set up any number of events and publish them in an events calendar on your Wild Apricot site (or another website). From the events calendar, visitors can view event details, sign up for events, register guests, and pay registration fees online. Wild Apricot allows you to customize the events calendar page, the event registration form, and the event emails (announcements and reminders). You can use the registration form to collect information about attendees (like meal preferences and breakout session choices) and to provide additional event options (like golf or concert tickets) available at a separate cost. You can restrict each event to selected membership levels, and set up multiple ticket types – aka registration types – so you can charge different prices for different event packages or for different kinds of attendees. You can use Wild Apricot to send mass emails – such as newsletters and announcements – to people in your contact database. You can send an email blast immediately or schedule it to be delivered automatically at a particular date and time. You can control who receives your email blasts by searching or filtering your member list or contact list. You can create your email blasts from scratch, use a previously sent email, or choose one of the professionally designed email templates provided by Wild Apricot. In either case, you can add text, formatting, graphics, and links to the message. To personalize the message, you can use macros to insert specific information such as the recipient's first name or organization. You can also use macros to insert an unsubscribe link. After you've sent your email blast, you can track opened, clicked, and undelivered mail, and review email failures. 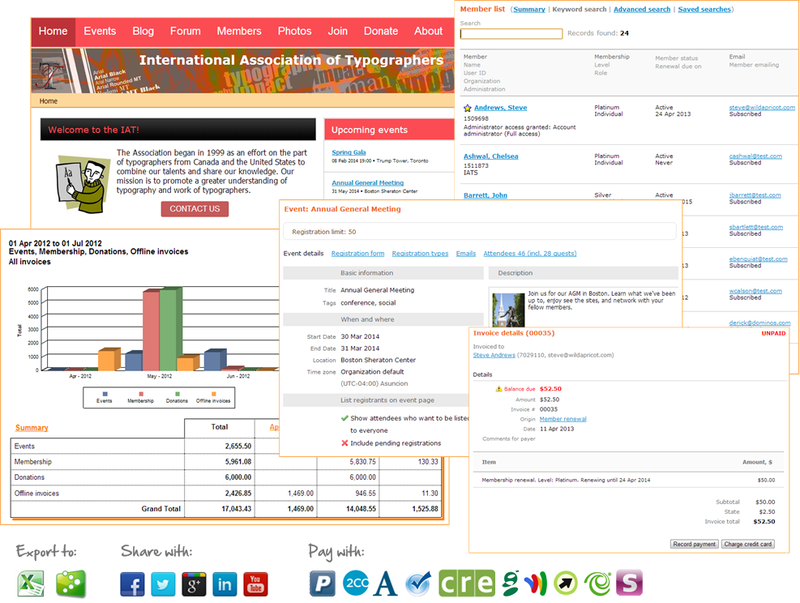 Invoices are automatically generated for all transactions on your Wild Apricot site. You can view and manage invoices – and payments – from the Finances module. You can search for invoices and payments or filter each list to display certain types of transactions, or transactions within a certain time period. Contacts can also view a full history of their payments and invoices (see Viewing account history and paying invoices). You can set up your Wild Apricot site to accept donations, so visitors to your site can provide financial support to your organization. Donations can be made through a donations page on your site or recorded manually by administrators. Once a donation is processed, it can be modified, deleted, or refunded. You can view a list of donations by date or by donor, and export the donations records to a spreadsheet. For more information, see Donations. You can set up your Wild Apricot account to accept online payments for various transactions on your website – membership dues, event registration, donation, and other invoice payments. For membership dues, you can set up recurring payments – automatically charge credit cards on a regular basis – depending on your payment system. You can also manually record offline payments – payments received outside of Wild Apricot (e.g. check, cash, wire transfer, or credit card payments charged outside of Wild Apricot). Every payment recorded in Wild Apricot automatically generates a receipt. You can look up recorded payment details and process refunds. A refund can be processed manually by an administrator or automatically when Wild Apricot receives a refund notification from your online payment processor. Payments can be classified by tender – the method by which payment was received. For online payments, tender is recorded automatically (e.g. Online - Authorize.Net credit card payment). For manual payments, you can select the tender when the payment is recorded (e.g. Cash or Checking account). You can customize the list of tenders as needed. For more information, see Payment tenders. Online payments are automatically matched to appropriate invoices. For information on manually matching payments to outstanding invoices, see Recording payments and settling to invoice.